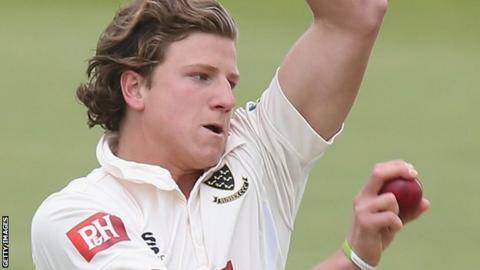 Sussex bowler Matthew Hobden, who has died aged 22, was a "gentle giant", according to his amateur club captain. Hobden was found dead at a private property in Scotland on Sunday. The cause of his death has not been given. Jeremy Green, the first XI captain of local league side Preston Nomads, said the news was "a massive shock". "When he walked into a room, he lit it up," said Green, who felt Hobden could have played for England. "He was larger-than-life on and off the field." Green said Hobden's "passing is unbelievably hard to take", adding: "Our thoughts go out to Matt's family and close friends at this really tough time." Hobden was regarded as a potential future international and England players wore black armbands on day two of the second Test against South Africa in Cape Town. "We had a nickname for him which was BMH, 'Big Matt Hobden'," said Green. "He was certainly one of those guys who, although being a gentle giant, could still bowl you a 90mph bouncer. "For a guy of 22 to have had such an impact is really testament to him as a person and really reflects how happy and joyous he was." In addition to Green's sentiments, Preston Nomads Cricket Club issued a heartfelt tribute to Hobden. It said players "felt honoured to be a part of his story", that they would "miss him terribly" and it is a "heartbreaking injustice" not being able to see how far he could have gone in the game. Hobden attended Millfield School in Somerset and Eastbourne College. He studied business economics at Cardiff Metropolitan University before focusing on his sporting career. As a youngster, he played for Glynde & Beddingham Cricket Club in East Sussex. Aged 16 and nicknamed 'Hobbo', he was part of their senior squad as they became the first Sussex side to win the National Village Cricket Knockout Final held at Lord's in 2009. "Matthew was often back at Glynde to cheer the club on and he will be greatly missed by us all," said a club statement. Hobden joined Preston Nomads in 2012 and helped them win the Sussex Premier League title that season. Within two years, he had signed a professional contract with Sussex. "The first time he played for us, we were sitting around in the dressing room afterwards and I was speaking to the vice-captain and said 'we're not going to see much of him, he's destined for far greater things than playing amateur cricket,'" said Green. "I have no doubt he would have played for England or certainly been very close. "Whether he bowled 15 overs or had a hard day in the field, he still had a smile on his face at the end of the day. "He just loved playing cricket and loved his life that went with it. It was his naturally sunny disposition." Hobden took 23 wickets at an average of 47.30 in 10 County Championship Division One games last season. "It was very noticeable what an absolutely beautiful bowling action he had," said Green. "He was a big guy, huge, long delivery strides, almost effortless really. "It seemed like he didn't have to put too much effort in... the ball just came out at 85-90mph the whole time." But he also excelled with the bat, hitting an unbeaten 65 in a record 10th-wicket stand for Sussex with Ollie Robinson in April 2015. "He was a natural athlete," added Green. "His full-length diving stops, for a guy who was about 6ft 5in and 90 kilos, possibly heavier, was a phenomenal thing to see. I was quite shocked the first time I saw it. "He was just a natural ball player. That came through as we always used to bat him quite high up the order. He had a couple of half-centuries for us." Hobden last turned out for the Nomads on 28 August, 2015, when his figures of one for six, including two no balls, off seven overs helped secure victory against Middleton in their final game of the summer. "I think they were slightly perturbed when they saw Matt rock up for us," said Green. "The speed the ball was coming down at and the areas he was bowling were far too good for the batters. It was hitting the keeper's gloves before the batsmen had a chance to play a shot. "What was noticeable for me was his willingness to still play amateur cricket while at the same time being a fully fledged professional. That was always a real breath of fresh air. "He just wanted to play cricket because he enjoyed it so much. "Even if he'd had a really hard week in the field and had been playing five or six days a week, he'd still turn up on a Saturday for a little amateur club like ours and give 110%. That was just the guy he was. It was in his blood."